Jose Garcia, born in Pamplona, defines himself as a passionate hairdresser. With almost twenty-five years behind his back in this profession, twelve of whom running his own salon, he is considered a restless professional and wanting to continually overcome. 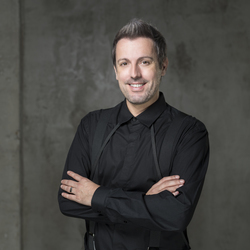 At the moment he is part of the artistic team of Schwarzkopf being able to enjoy its facet like trainer. Another of his great passions is reading and from there is born his penchant for writing. Whenever possible, he writes articles related to trends in fashion, hair and image consulting and collaborates frequently with newspapers and magazines, both aimed at the professional of our sector as the final customer. One of his greatest pride is his team. It has undoubtedly been the key to his success in the development of both his business and his artistic career, since without his support and delivery none of this would have been possible. So much so that he treats his team as his own family: always seeks to take into account the needs of each of his employees by conducting periodic meetings of team and individuals, internal training and applying numerous techniques of motivation. The two salons of Jose Garcia Peluqueros follow a unique architectural and decorative philosophy, are the result of a combination of chic and rustic styles. Even though a single volume, different sensations are perceived according to the corner where the observer is located.